From: I-95 south. Take Exit 249-A then go east on SR-44 four miles to the ocean. 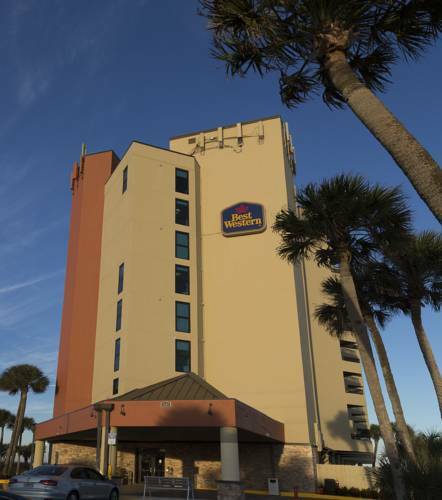 The Best Western New Smyrna Beach Hotel & Suites is directly on the beach. From: I-95 north. Take Exit 249 then go east on SR-44 four miles to the ocean. The Best Western New Smyrna Beach Hotel & Suites is directly on the beach. Seascape Dining Room, on premises, full service, American, open for: breakfast, dining room serving breakfast from 7:00 a.m. until 11:00 a.m. seven days a week. Ocean - 0.10 mile(s) from Atlantic Ocean, located directly behind the hotel. Pool - Outdoor pool Our beautiful oceanfront pool is not heated. 12.00 mile(s) from Destination Daytona, the world's largest Harley Davidson motorcycle dealer. See thousand of Harley Davidson's. 10.00 mile(s) from Daytona Raceway, where the running of the Daytona 500 occurs each year. 3.00 mile(s) from Ponce Inlet, just north of the hotel visit historic Ponce Inlet where the ocean blends into the Atlantic Riverway. 3.00 mile(s) from Turtle Mound, just south of the hotel down A-1-A to enjoy the historic sand dunes. 55.00 mile(s) from Disneyworld , just an hour away the Wonderful World of Disney . ~15 miles from New Smyrna Beach. ~49 miles from New Smyrna Beach. ~65 miles from New Smyrna Beach.